1. I’m sharing news of a very special sale! 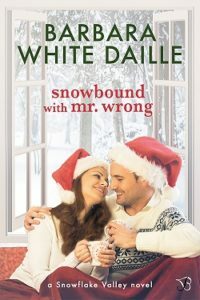 Entangled Publishing is offering Snowbound with Mr. Wrong, the first of my Snowflake Valley books, on a special 99-cent sale all month long! Entangled has links to some of your favorite etailers here. 2. I’m getting out a bit to visit some of my favorite blogs. Come see me at two of them today. At The After Work Cook, I’m sharing my all-time – and easy-peasy! – favorite cookie recipe, along with some tips to make the cookies even easier and more delicious. Find the post here. Then swing by Handbags, Books…Whatever, where I’m showing off a bag that’s one of my faves…but a bit of a challenge. 😉 Here’s that post. 3. And last but not least, tomorrow I’ll be sharing some special news about another one of my books. So stay tuned! Hope to see you around the Internet this week. To read yesterday’s Snippet Sunday teaser from Snowbound with Mr. Wrong, click your back button.